The RAV4 is one of the originals. Spanning 22 years and 5 generations, it’s a vehicle we’re all familiar with. So can this new model keep the masses happy? Automakers are getting better at really differentiating their trim levels in order to appeal to a wider audience and that’s certainly true here. From the no-nonsense LE priced from $26,545 to this fully loaded Limited at $39,479, Toyota has crafted various RAV4 grades, each with their own distinct flavor, including an Adventure model with a more robust appearance and greater towing capability to a new Hybrid that’s as much about added zip as it is 40mpg. On the spec sheet, the RAV4 has been stretched between the wheels adding to rear seat legroom. 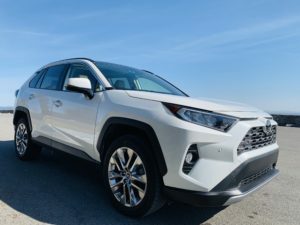 Its height has been reduced while ground clearance has been raised by over a half an inch, which leads to a new all-wheel drive system with Multi-Terrain Select that provides this RAV4 with an added dose of off-road spunkiness. Other than Jeep, this class generally puts 4-wheeling on the back burner so having mud and sand and rock and dirt modes is really cool. With advancements in powertrain electronics, the RAV4 can be fuel efficient and demure as well as capable and sporty. The 8-speed auto does offer ECO, Sport and Snow modes to further fine-tune the driving experience. That starts with a very sophisticated but very noisy 2.5-liter 4-cylinder producing 203 horsepower and 184 pound-feet of torque. Zero-to-60mph in 8.2 seconds doesn’t accurately communicate the feeling of acceleration from behind the wheel, which in around the town driving is more than sufficient to zip in and out of traffic. Plus, it sounds fast which creates the sensation of speed. But everyone I’ve had in here this week, myself included, has immediately mentioned how loud this motor is. And it’s not the kind of sound you’d crave, either. From a driving standpoint, it’s clearly evident that this new RAV4 platform knows driving dynamics. More precision and smartness in the way it moves, the suppleness of the ride quality, the more engaging steering and handling – it’s what Honda has done so well with their new CR-V platform and Honda closely matches that here. What the RAV4 loses to the CR-V in on-road drivability it more than makes up for in its newfound, adventurous spirit. When I first took delivery, it felt like the RAV4 was just another Johnny-come-lately in a sea of competent SUVs. But, as the week has worn on, I’ve not only come to appreciate what it has to offer but I’m thoroughly enjoying it. I think it’s really cool that Toyota has toughened this one up by giving it these off-road drive modes. It’s got a bit of Subaru in it now and that’s a nice get in this segment. So whether you’re traversing an icy trail or simply going deeper into the woods you can have the confidence that this vehicle will get you there. And then on the rear axle there is torque vectoring for the all-wheel drive system which will improve on-road handling. The ride quality, the body control and the steering have all been significantly upgraded, too. But what is with this gruff engine noise? It’s the very first thing you’ll notice when you drive the RAV4 and it’s far too much bluster for a vehicle that really isn’t very quick. This Limited grade with the highest level Advanced Technology Package impresses with its level of features as it should for nearly $40,000. Standout items include the rear view mirror camera, a la Cadillac, projecting a video feed of what’s going on out back. If you don’t like it, just flip it to its original mirror duties, an improved Entune experience with Apple CarPlay but not Android Auto support that’s customizable, easy to use, feature-laden and best of all not slow or glitchy. It is prone to glare, however as is the new customizable gauge display. The 360 degree camera is a great get…if you’re ever confronted with tight parking spots this will become your best friend. Wireless device charging, road sign recognition, auto high beams, dynamic radar cruise control, memory settings…it’s all in here including a hands-free liftgate. If this wasn’t a prototype, items such as ventilated front seats, a heated steering wheel, and heated rear seats would also be included. For a range-topping Limited trim this cabin feels well-stocked but not necessarily upscale. The big knobs and rubberized surfaces are very cool but perhaps they would’ve been best left in the Adventure grade. The cabin is a little noisy but quite comfortable and the ergonomics are excellent unless you’re in this passenger seat which has no height adjustment; a penny-pinching move that is definitely a fail. Reclining rear seats, a longer cargo area, more storage cleverness and respectable though not class leading fuel economy of 28mpg keeps the family unit happy. And that’s the new RAV4 in a nutshell; not particularly flashy but more capable and simply stated: really good at its job.